NEW YORK, New York, June 1, 2017 (ENS) – Baby teeth from children with autism contain more toxic lead and less of the essential nutrients zinc and manganese, compared to teeth from children without autism, according to an innovative study funded by the National Institute of Environmental Health Sciences, NIEHS, part of the National Institutes of Health. The researchers studied twins to control genetic influences and focus on possible environmental contributors to the disease. The findings, published today in the journal “Nature Communications,” suggest that differences in early-life exposure to metals, or more importantly how a child’s body processes them, may affect the risk of autism. Autism spectrum disorder, or ASD, is a complex developmental disability; signs typically appear during early childhood and affect a person’s ability to communicate, and interact with others. ASD is defined by a certain set of behaviors and is a “spectrum condition” that affects individuals differently and to varying degrees. There is no known single cause of autism. Symptoms include: lack of or delay in spoken language, repetitive use of language or motor mannerisms such as hand-flapping, twirling objects, little or no eye contact and lack of interest in peer relationships. About one percent of the world population has autism spectrum disorder, according to 2014 figures from the Centers for Disease Control and Prevention in Atlanta. Prevalence in the United States is estimated at one in 68 births, and in 2014, the latest year for which figures are available more than 3.5 million Americans were living with an autism spectrum disorder. Autism is the fastest-growing developmental disability in the United States. Prevalence of autism in U.S. children increased by 119.4 percent from 2000 (1 in 150) to 2010 (1 in 68). Autism services cost U.S. citizens $236-262 billion annually, according to the nonprofit Autism Society. The NIEHS study shows that the differences in metal uptake between children with and without autism were especially notable during the months just before and after the children were born. The scientists determined this by using lasers to map the growth rings in baby teeth generated during different developmental periods. The researchers observed higher levels of lead in children with autism throughout development, with the greatest disparity observed during the period following birth. They also observed lower uptake of manganese in children with autism, both before and after birth. The pattern was more complex for zinc. Children with autism had lower zinc levels earlier in the womb, but these levels then increased after birth, compared to children without autism. Patterns of metal uptake were compared using teeth from 32 pairs of twins and 12 individual twins. The researchers compared patterns in twins where only one had autism, as well as in twins where both or neither had autism. Smaller differences in the patterns of metal uptake occurred when both twins had autism. 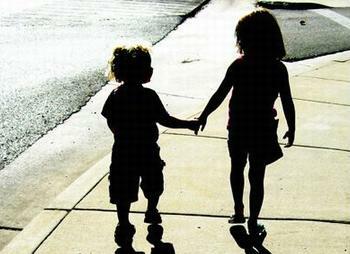 Larger differences occurred in twins where only one sibling had autism. The study was led by Manish Arora, Ph.D., an environmental scientist and dentist at the Icahn School of Medicine at Mount Sinai in New York. With support from NIEHS, Arora and colleagues had previously developed a method that used naturally shed baby teeth to measure children’s exposure to lead and other metals while in the womb and during early childhood. 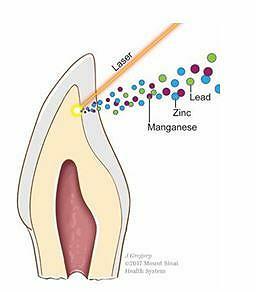 The researchers use lasers to extract precise layers of dentine, the hard substance beneath tooth enamel, for metal analysis. The team previously showed that the amount of lead in different layers of dentine corresponds to lead exposure during different developmental periods. The method of using baby teeth to measure past exposure to metals also holds promise for other disorders, such as attention deficit hyperactivity disorder. “There is growing excitement about the potential of baby teeth as a rich record of a child’s early life exposure to both helpful and harmful factors in the environment,” said David Balshaw, Ph.D., head of the NIEHS Exposure, Response, and Technology Branch, which supported the development of the tooth method.